Licensed College Jewelry!! Lead & Nickel Free Sterling Silver Plated Lobster Clasp Necklace Suspends The Baylor University Bears Logo And Mascot. 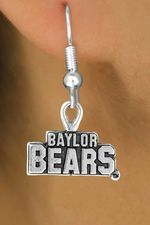 Scroll Down For More Baylor University "Bears" Items: W12832N, W12833E, W12834B, W12836E, W12837B, W13402SG, W13462N, W13463SG, W13464N, W13850KC, W13851KC, & W14311KC!